Riding a bus to and from school in Altar Valley School district is a privilege not to be taken lightly. All students must understand and observe good conduct, courtesy, cooperation, and respect for the authority of the bus driver. If other students are waiting to board the bus, get in line without pushing or crowding, and stay off the roadway. Wait until the bus comes to a complete stop before attempting to get on board. Board the bus quickly but without crowding or pushing. Go directly to your seat and sit quietly while facing the front of the bus. The bus will not move until all passengers are seated. Remain seated throughout the trip, and leave your seat only when the bus has reached its destination and comes to a complete stop. Do not change seats or stand. Keep the aisle and emergency exits clear of all objects. Do not talk to the driver except in case of emergency. Never stick hands, arms, head, or feet out of the windows. Do not throw anything on or out of the bus. Do not touch the emergency door or exit controls or any of the safety equipment on the bus. Obey the directions and instructions of the school bus driver promptly. Keep hands, feet, and objects to yourself. No kissing, improper touching, hitting, physical attacks, or assaults. Talk quietly, with respectful language. Do not use profanity. Do not use cell phones. The bus driver or monitor will confiscate any cell phones they see or hear. Remain seated until bus comes to complete stop. Do not push or crowd when leaving the bus. When a student misbehaves on a bus for the first time, the driver will explain to the student the necessity for good behavior. If, after talks and warnings, the student continues to violate the rules, the driver will inform the student that the rule violation will be reported to the principal. This report will include the use of a written form that lists the offense and action taken by the driver. 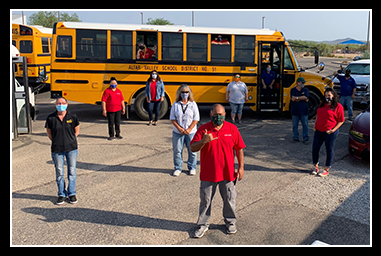 Upon receiving the complaint and discussing it with the driver, the principal will call the student to the office and warn the student that the parents must be notified that the student will be put off the bus if misbehavior reoccurs. If poor conduct continues, the driver will again report the incident to the principal. After discussion, it will be decided whether to take the bus-riding privilege away from the student and if so, for how long. When a student is not allowed to ride the bus, the principal will inform the parents of the penalty, the reason for it, and how long the penalty will last. The parents become responsible for seeing that their child gets to and from school safely. 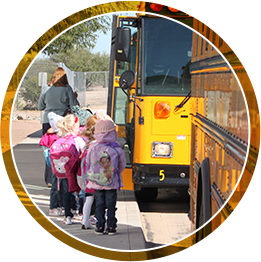 For information about Marana High School, please call the Marana High School Transportation Department at (520) 682.1055.